The type specimen used for original description comes from Central America, Nicaragua. 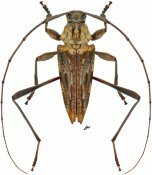 Anisopodus hamaticollis Bates, 1872 is the full name of the group-species in the taxonomic classification system. The species is combined with the Anisopodus genus ranked in the Acanthocinini tribe of Lamiinae.